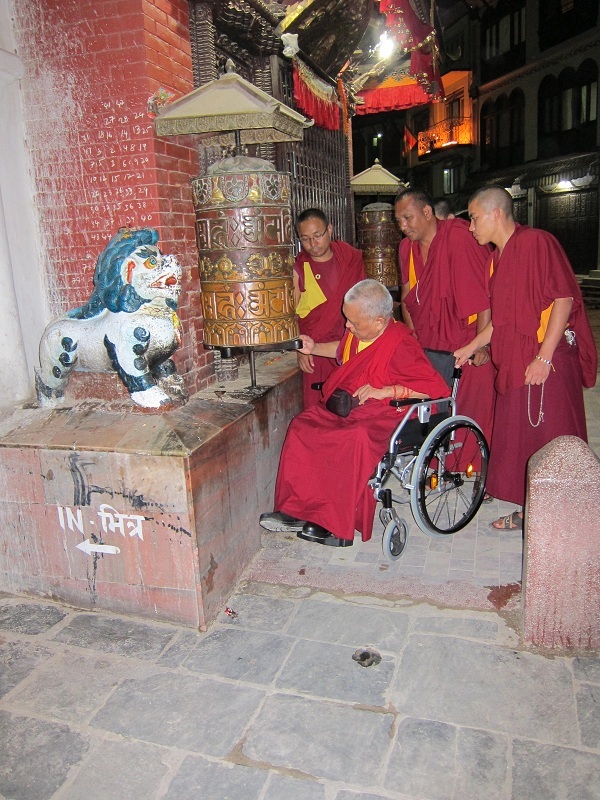 Lama Zopa Rinpoche turning a prayer wheel with great effort using his right hand. Rinpoche does 3 koras at Boudhanath stupa walking (with help), and then does 7 koras in the wheelchair, each time stopping to turn the prayer wheel, using his right hand. Rinpoche is doing well with his recovery. Now the main emphasis is on keeping a strict daily discipline of exercise, massage specializing in clearing the blockages for helping to restore normal use of the right side) and physio work. 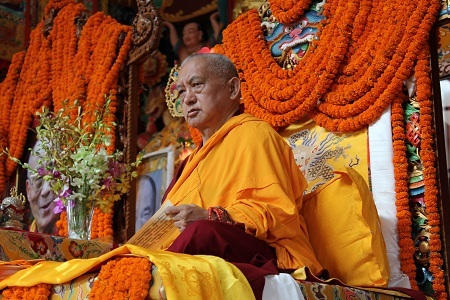 The discipline in the past has been interrupted here for various reasons … now we need to be even more strict as we have been warned that the optimum time for restoring Rinpoche’s physical condition to normal is quickly passing … the next few months are critical. Rinpoche has a full day of exercise etc. starting with the physio coming at 7.45 am … there are some breaks through the day for Rinpoche to do prayers etc. … then in the evening Rinpoche does korwa at either Swoyambhu or Bodha stupa… Rinpoche believes this is one of the best activities for purification as well as physical exercise, of course it gets interrupted sometimes due rain … monsoon, still sometimes Rinpoche does korwa in the rain. 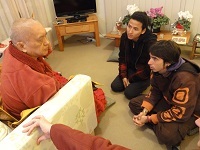 Our request to those who would like to visit Rinpoche is … please not in the next few months, of course if it was just 1 or 2 visits it would be fine but many would like to visit and then the schedule goes out the window as Rinpoche will not say no… he very much focuses on others. Over the last week Rinpoche hasn’t been regular in the physio and exercise, I guess it was a bit of an experiment from Rinpoche’s side but also due to business with other programs. The physio came this morning (after 1 week absence) and confirmed that generally the muscles lost their tone and this is due to not exercising them regular and many times in the day. So again it requires a lot of discipline mostly from Rinpoche’s side to keep moving/training the muscles in every part of the right side … even all the facial ones … as over the last week even the speech has deteriorated. For a diabetic the physio says it is more difficult as the muscles become fatigued quicker, so requires more repetition for shorter periods also rest in between. And even Rinpoche can walk the 3 kms around Swayambhu much of that time can be that he becomes lazy in the way the right leg is used … swinging it from the hip rather than bending at the knee in a forward action. So we have to have Rinpoche stop regularly rest and then start again … working quality rather quantity. Then the need to focus on balance and coordination … as well as speed to react with the right muscles. All this has to be worked into normal daily actions all the time and this requires most of all Rinpoche’s participation and cooperation. It is hard for Rinpoche as he is not so familiar and disciplined with physical exercise … as well it requires more effort and repetition for a diabetic … interspersed with short periods of rest. This morning the physio (he is very good and Rinpoche listens to him!) came at 7-45 am (his normal time for a session) … he expects Rinpoche to be rested in the morning … but in fact Rinpoche has been doing prayers/meditating most of the time thru the night… so not rested … the body is a little tired and not responding well to the exercises … so change of strong habits … again not easy. Rinpoche finished a 10 day course of acupuncture a week ago and will not continue more at this time. Khadro la is back in Nepal and is doing massage and her physio style … similar to the physio but more aggressive! Interesting to see the similarities … Khadro la is very confident in what she does and Rinpoche seems to respond well. In the background we have 4 western doctors overseeing from a distance Rinpoche’s progress with the blood pressure and blood sugar levels. Blood pressure is getting better (with western medication) and is reasonable now; also the sugar levels are better but using insulin injections 3 times a day. The big challenge at present and for the next several months is the discipline with regular physio and exercise through the day, every day, so Rinpoche needs the space and conditions to do that. This is the reason why Rinpoche has not been accepting appointments. Still Rinpoche puts effort into the necessary organizational work and responsibilities which he has a lot of energy for. Thank you to everyone for all your support in so many ways. 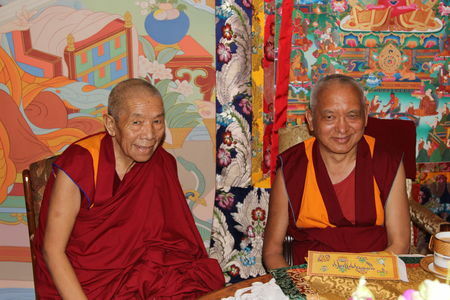 Lama Zopa Rinpoche and Khenrinpoche Lama Lhundrup at Kopan Monastery, Nepal. June 2011. Rinpoche is doing well and still in Nepal. Rinpoche is walking without aid now though someone has to walk close behind in case Rinpoche stumbles. Rinpoche has to drag the right leg a little and use his hip a little to swing his leg around to make a step but quite an improvement as he is independent. When we leave the gompa and return he has about 57 steps go down and up … that is hard and needs a lot of care to manage. Right arm has more movement now but hand still has no energy to hold anything and arm has little energy to support in normal activity. Speech is slowly improving right side of mouth little movement. Rinpoche’s day is quite full, starting at 6:30 am practicing movement, 7:45 am physio session, then massage, afternoon is movements and then acupuncture and every evening is circumambulation of Bodha stupa or Swayambhu. So quite a full day. Rinpoche is quite happy and eager with trying to get back to normal physical health. Many times a little too eager! Sense of humor seems even better than before, especially about his own situation … Sometimes he bursts out laughing about trying to do some exercise and it isn’t working. 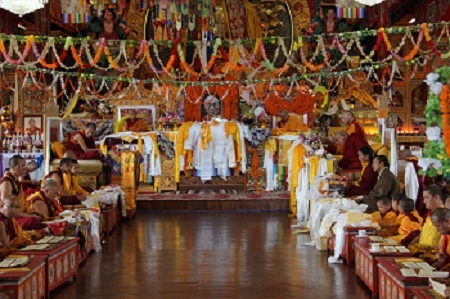 The main lamas attending the puja are Dhakpa Rinpoche, Dagri Rinpoche, Serkong Dorje Chang, Khen Rinpoche Lama Lhundrup, Khadro la and Lhatsung Rinpoche (a lay lama). Rinpoche is now in Kopan , arrived 2 days ago. Today there is a special long life puja for Rinpoche. Then over the next 2 weeks a number of pujas. Rinpoche’s walking is improving but still the right foot does not have much movement in the toes. The right arm has a little movement, there has not been much improvement in the speech. Hoping to see more improvement over the next few weeks while here. It is a time to focus on Rinpoche’s health as much as possible. Again Rinpoche is saying it will take time to heal. What is good is that Rinpoche has a little independence now … he can move around a little without support … but still a little shaky. 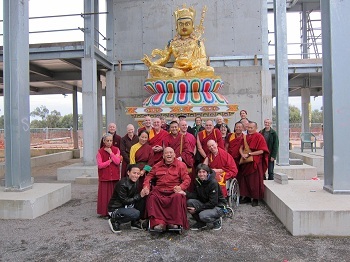 May 29th – Rinpoche’s first time out publically, introducing Khadro la, Osel and Gomo Rinpoche to the Great Stupa of Universal Compassion, Bendigo, Australia. Khadro la has been with us for the last 7 days and has been helping Rinpoche a lot with the right side that is partially paralyzed. Khadro la has been very helpful in explaining what is happening as she can actually see the subtle aspects of the body that normally ordinary people cannot see. So from her direct experience of seeing the subtle energy blocks etc she has methods for helping the body to regain its normal functions. It’s quite amazing to see her working very confidentially and with such determination. For the past few weeks Rinpoche has been continually saying to us that “the paralysis will take time to heal … it won’t happen soon”. Rinpoche would add .. “no matter what medicines or methods are used etc until the karma is finished my situation won’t get better”. There has been slow improvement with the right arm and muscles in the mouth … causing the slur and difficulty in speech. The right leg has improved so that Rinpoche can walk short distances unaided but needing someone nearby incase he stumbles. Rinpoche says he has to focus a lot on exercising the right side of the body over the next months and until then will not be able to do any public Dharma activities … this means we will have to cancel all Rinpoche’s public program thru the remainder of 2011. Rinpoche’s blood pressure is still high, it is proving difficult to get it down. Rinpoche is on insulin now and the doctors are ok with the present sugar levels. Khadro la has given very good advice for the near future and said it’s important for Rinpoche to have rest and be in a healthy environment. Rinpoche received a surprise visit from Osel and Gomo Rinpoche , they flew from Europe to be with Rinpoche for a several days … very nice to have them around… their mission they said is “to bring love”. Thank you to everyone for all the prayers and well wishes … please continue … they are still very much needed. Rinpoche circumambulates 3 times a day the relics for 30 mins. This requires no encouragement at all … it’s done with enthusiasm! Then needs to rest … which is the same after each physio therapy session. 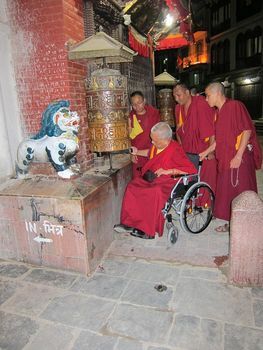 Now Rinpoche needs only a little support when walking short distances , longer distances a wheel chair is needed. Last Thursday after the brace was fitted to Rinpoche’s right leg by the Prosthetist Orthotist … Rinpoche said “when I came back from having the brace fitted I had a rest and dreamt of His Holiness, after the dream I was able to move 3 fingers (right hand) that I wasn’t able to move before and also I could read mantras quicker, so a little bit better, slight, but can’t tell how long”. This was good news as not much was happening with the right arm, now there is a little more movement in certain directions … still a long way to go with the arm. Speech is also slowly improving … still a slur. With all the exercises for leg, arm and speech it doesn’t take long for Rinpoche to tire … for the short time before tiring he does well, then tiredness sets in and the excises become difficult as no strength. Rinpoche has not started acupuncture or Chinese medicine … saying according to his mo seems need to delay a little longer before starting. I would think now we will settle into a routine for the next month or 2 focusing on the physio and lots of rest. Ven Roger Kunsang’s latest blog.